We don't usually think of drones as operating over open water, but Aerovel's Flexrotor drone was designed to do just that. 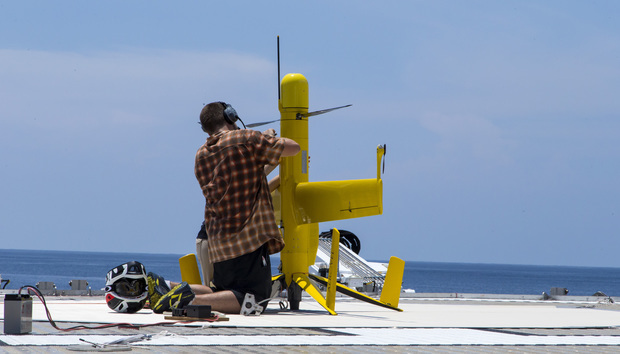 "What they were intended for was to go out and spot tuna or anything that you needed to find in an austere environment where manned aircraft are no longer safe," says Matt Parker, vice president of Precision Integrated Programs, a company signed up to be the launch customer for Flexrotor. Since its inception, Flexrotor has gone on to hunt for humans as well. "Our first mission we went out for was actually to protect marine protected areas," Parker says. "We were out at sea, Cocos Island, 300 nautical miles off the Pacific coast of Costa Rica, to monitor the marine protected areas and make sure there weren’t illegal poachers and shark finners and such in the area." More recently, Flexrotor was used to guide a fleet of ships through ice in the Arctic. The drone can carry up to a 4.5-kilogram payload and can be equipped with a number of sensors, including LIDAR, infrared, and multispectral. It also serves useful on land, in places where there isn't much space to land, like small fields in a forest. Full-scale production of the Flexrotor will begin in the first quarter of 2017, Parker says.